Total length : 3200 km (1988 miles). 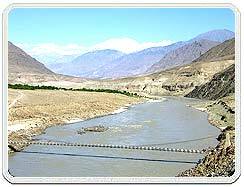 Indus River is the longest and most important river in Pakistan and one of the most important rivers on the Indian subcontinent. Beginning at the heights of the world with glaciers, the river feeds the ecosystem of temperate forests, plains and arid countryside. The Indus is one of the few rivers in the world that exhibit a tidal bore. The Indus system is largely fed by the snows and glaciers of the Karakoram, Hindu Kush and Himalayan ranges of Tibet, Kashmir and Northern Areas of Pakistan. This river makes a sharp turn south of Pangong Lake and cuts through the Ladakh range. Further downstream it turns towards the south and rounds the western flank of the Nanga Parbat massif to take a westerly course and leave the Himalayas near Sazin. It swiftly flows across Hazara, and is dammed at the Tarbela Reservoir. The Kabul River joins it near Attock. The remainder of its route to the sea is in plains of the Punjab and Sind, and the river becomes slow-flowing and highly braided. It is joined by Panjnad River at Mithankot. Together with the rivers Chenab, Ravi, Sutlej, Jhelum, Beas and the extinct Sarasvati River, the Indus forms the Sapta Sindhu ("Seven Rivers") delta in the Sindh province of Pakistan. It has 20 major tributaries. The Indus is the most important supplier of water resources to the Punjab and Sindh plains - it forms the backbone of agriculture and food production in Pakistan. 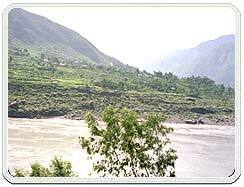 The river is especially critical as rainfall is meagre in the lower Indus valley. The ultimate source of the Indus is in Tibet; it begins at the confluence of the Sengge and Gar rivers that drain the Nganglong Kangri and Gangdise Shan mountain ranges. The Indus then flows northwest through Ladakh-Baltistan into Gilgit, just south of the Karakoram range. The Shyok, Shigar and Gilgit streams carry glacieral waters into the main river. It gradually bends to the south, coming out of the hills between Peshawar and Rawalpindi. Higher elevations in Kashmir and the Northern Areas receives a large amount of precipitation in the form of snow, but the lower valleys are extremely dry and quite warm in the summer. The upper basin of the Indus receives 4-8 inches of rainfall (higher in the west) in the winter months owing to northwestern winds. Annual temperatures fall below freezing in the northern mountainous regions in the winter, while exceeding 100 degrees Fahrenheit in the plains of Punjab and Sindh in the summer. The Punjab plains, however, receive considerable rainfall from the summer monsoon. Flash floods are known to have occurred in the Indus basin from time to time. The most devastating flood occurred in the latter part of the last century when a dam formed by an avalanche burst in the Indus catchment of Ladakh. Huge loss of life and property occurred in the area at that time. Palla fish (Hilsa ilisha) of the river is a delicacy for people living along the river. The population of fishes in the river is moderate. Sukkur, Thatta and Kotri are the major fishing centres. These all are in the lower Sindh course. Here marine fishes are found in abundance, including pomfret and prawns.Damming and irrigation has made fish farming an important economic activity. The Blind Indus River Dolphin (Platanista gangetica minor) is a sub-species of Dolphins found only in the Indus River. 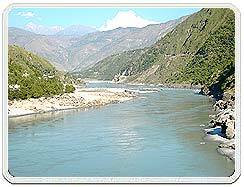 It formerly also occurred in the tributaries of the Indus river. 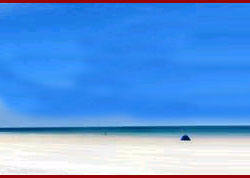 There are a number of human settlements that lie along the Indus River in Ladakh, namely Leh, Marol, Skardu and Bunji. Other rivers in Ladakh, which form tributaries of the Indus and its feeder streams, include the Nubra River and the Drass River.